Meditation is a wise and skilful way of coming to understand and relate to all of our our experiences with awareness and presence. It introduces us to a way of “being” rather than “doing” which can bring a profound sense of wellness and a surprising acceptance as we face the challenges of life at any age. In this retreat we will use simple meditation methods and contemplations to deepen our appreciation of our later years as a time to reflect and find meaning, to express love and forgiveness and to enjoy and complete life well. Our Free Spirit programme reflects the wish that finances should not be a barrier for people wishing to attend events – so for Free Spirit events we do not set a retreat fee and charge only to cover catering costs. After that you are invited to make an offering according to your means, to help cover the costs of hosting the retreat and to ensure that Free Spirit events continue into the future, but there is no obligation. Concession rates and flexible payment options are available for all other retreats. The retreat will be held in our clifftop shrine room, with floor-to-ceiling windows offering spectacular ocean views. Delicious two course vegetarian lunches, with soup and bread in the evenings. Cooked with love at Dzogchen Beara, using homegrown and organic ingredients whenever possible. Tea and coffee. Unfortunately the event is already booked out. Please contact the office at info@dzogchenbeara.org to go on the waiting list. Dzogchen Beara has a policy of not turning anyone away for financial reasons. Please email info@dzogchenbeara.org to request assistance from our retreat fund or to discuss flexible payment options. Limited accommodation is available on-site. Book early! A list of hostels, B&B’s self-catering accommodation and hotels in the local area can be downloaded here. Vegetarian lunches and light evening meals are provided. The cost is included in your fee. Christine Whiteside has been a student of Buddhism since 1978 and is a founder member of Dzogchen Beara. 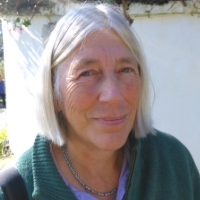 She is a Rigpa senior instructor and Spiritual Care Educator offering retreats and seminars on meditation, compassion and spiritual preparation for dying both at Dzogchen Beara and around Ireland. Christine also trained in Clinical Pastoral Care at Cork University Hospital.